"Reading greens has been so much better since I took the class"
All I can say is that reading the greens has been so much better since I took the class. I was terrible at reading greens. Now I go strictly on the feel of my feet with my eyes closed. My reads are very good now, so I just need to fix my stroke! I am doing much better on my putts from 10-20 feet, a lot better! Making a decent amount of them now! I had 4 birdies at Grand Bear the other day, but missed 4 putts of about 4 feet—three pulls due to shutting the face, then an overcorrection push right on the last one! My 77 should have been a 73. Thanks!" Jason Dufner has something to trust now! 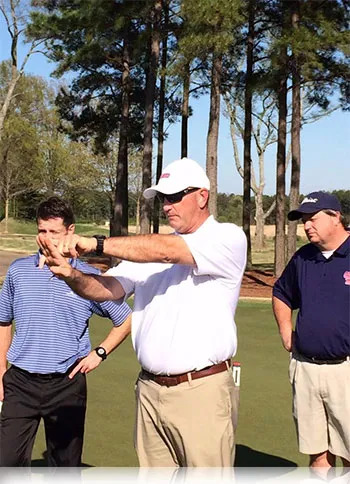 Jason Dufner said after an AimPoint Express training session with Rob Noel that "I have something to believe in on the greens"! 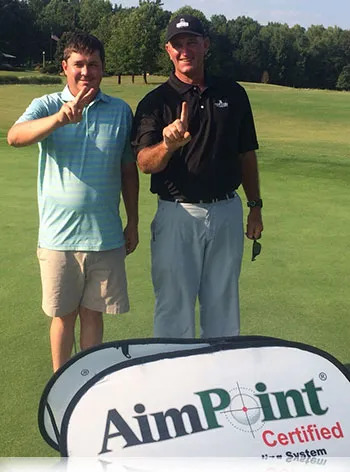 I had the pleasure of introducing Major Champion Jason Dufner to Aimpoint Express and that's what he had to say when we finished our training. My staff and I have the opportunity to help ALL golfers #makeeverything at Rob Noel Golf Academy and Big Easy Golf Academy. Come learn with us!